Plans for the retirement village. 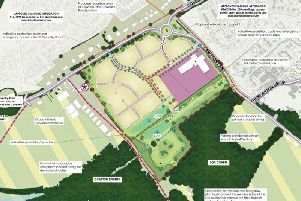 Rugby’s planning committee looks set to throw-out controversial plans to build a retirement village on Oakfield Recreation Ground. The much-loved park on Bilton Road is owned by the Heart of England Co-operative Society and was previously leased by Rugby Borough Council when it was used as an open space for residents. But its owners fenced it off in 2016 after the council refused to grant planning permission to build houses on the site. A newer plan to build a 62-apartment, 14-bungalow retirement village on the park has been met with condemnation from residents, including the Save Oakfield campaign group, and councillors. The Co-op has repeatedly rejected offers from Rugby council to buy the land. Council officers have recommend that the plan be rejected at Rugby Council’s planning meeting to be on Wednesday, December 5. To view the full application, visit Rugby council's planning portal here and search for application reference R18/0214.